Unique Learning System®​ has complete alignment to state and educational standards. Using the Alignment Tools available, subscribers can make connections to their extended state standards. Unique Learning System uses Instructional Targets to define the essence of content standards. Instructional Targets are the bridge between the general content standards adopted by a state and relevant curriculum content for students with significant disabilities. Your state's extended standards are possibly very alike, if not identical in some instances to n2y's Instructional Targets. Users can find Alignment Documents in the Alignment Tools section in Teacher Reference Materials. 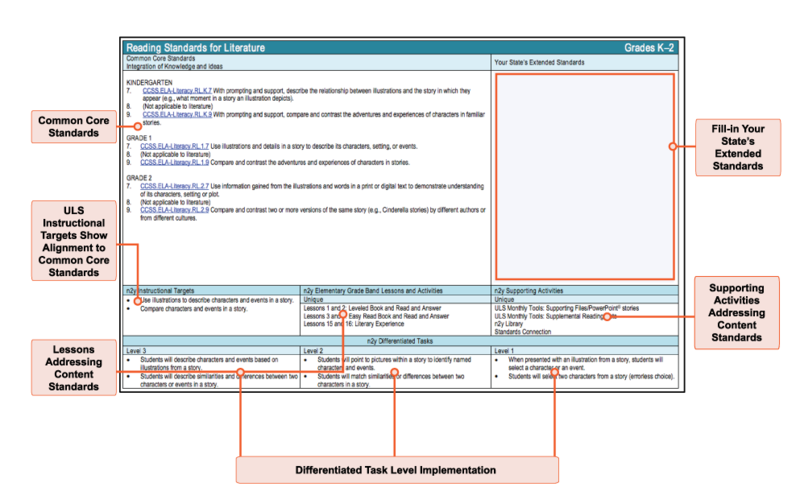 The Alignment Documents should be used to ensure students with adverse abilities are connected to and have access to the content standards. The Alignment Documents are in PDF forms, enabling users to fill in their state's extended standards. How Are Assessments Scored in the GPS? How is News-2-You Aligned to Standards?